*REMEMBER: NEVER SHARE YOUR EYE MAKEUP!! YOU COULD SPREAD INFECTION!! All makeup must be earth tones (browns, wine, apricot) no blues, pinks or reds. This is a picture to use as a guide for make up at performances for students age 10 and over. See below for makeup for students under age 10. The eye make up on the face picture is for smaller stage performances like Fort Walton Beach Civic Center or dances in the park. This eye is an example for ours dancers age 10 and younger. The dancer only needs one brown line extending out from underneath the white. The eye make up pictured below the face is for the larger stage performances like OWC. The difference is in the use of the white (clown white) under the eye brow line and in the crease of the eye as well as two dark lines surrounding the white. • First use concealer under the eye and where deep shadows on the face occur, like deep- set eyes. • The foundation needs to match the dancer's skin tones – not too light or too dark. • Blush needs to be earth tones, not rosy or pink. The dancer needs to make a fish face and the blush is applied under the cheek bone to create a shadow and carry the blush out and up toward the hair line. • Eye shadow starts at the middle of the eye, not the corner by the nose. Apply a dark brown eye shadow and carry out to the eye brow. This should be done on the lower half of the eye lid. 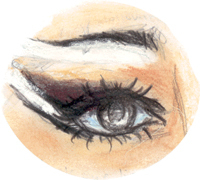 Then apply a lighter brown above the darker shadow, still from the middle of the eye, and follow up to the eye brow. • Use eye brow pencil, but only black, brown or dark gray – no blues. • Apply black mascara to eyelashes. • Lipstick needs to be deep burgundy, deep brown, apricot or wine. NOT RED. • The eye makeup for a larger stage needs to be darker and have white accent lines. • The eye shadow needs to be the same as the above example, but now apply a white line under the eye brow and following the curve of the eye brow. Use clown white for this. • White also needs to be applied at the outer corner of the eye and carried out towards the eye brow. • Dark eye liner is placed both below the bottom white line from the lower eye lash out to eye brow and above that same white area. • Use the dark liner on the eye brow.